Baconnaise (aka Bacon mayonnaise) is my new obsession! Bacon is the food of the gods and making mayonnaise with it means that you can slather that Bacon-y goodness all over everything! What would use put Baconnaise on? 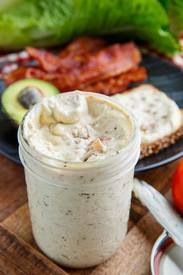 Click here for this recipe: https://www.closetcooking.com/2018/05/baconnaise-aka-bacon-mayonnaise.html.